​Maybe it took a clumsy telephone call to bring some improvements to the Amarillo Emergency Communications Center. The phone call occurred in February, when interim Amarillo City Manager Terry Childers reported a of what he thought was the theft of a brief case from a hallway outside his hotel room. He was agitated. The call-taker at AECC received his phone call and began asking him a prescribed set of questions in accordance with a "protocol" that had been established when the AECC was formed. Childers didn't like the manner in which the person on the other end of the line was responding to what he thought was an emergency. He demanded to speak to her superviser; he also demanded that several police officers be dispatched to the hotel where he was staying to find the brief case. He demanded that the Amarillo Police Department "shut down" the hotel while the cops looked for the item. The call didn't go well. The brief case — which Childers said contained some "sensitive" documents — eventually was recovered. It had been misplaced, not stolen. That didn't lessen the interim manager's anxiety over the way the call went. He instituted some changes effective immediately at the AECC. Chief among them was the deployment of police officers and firefighters to work inside the call center next to the call-takers. Live Here examines those changes in its next segment. Karen Welch, senior content producer for Panhandle PBS, interviewed the former AECC director, Judith Weshinsky-Price about the new protocols established at AECC when she ran the unit; she was manager of the call center until August 2015. The consolidation came with some pluses and negatives. The reduction in call transfers when someone calls is a plus, Price said. However, she added that there needs to be better communication between agencies, which she said would help them coordinate their efforts in responding to a caller's emergency. That's where the addition of cops and firefighters in the call center comes in, Price said. Everyone's definition of an "emergency" differs, she said. "It depends on the caller," Price noted, adding that "no one is having a good day" when they have to call the 9-1-1 emergency communications center. Welch asked Price: How did the call-takers perform when they took Childers' call in February? Did they follow the protocol established? Price — who said she listened to all three calls that Childers made to the AECC — said the dispatcher performed according to how she was trained and that she did act appropriately and professionally when she got the call from Childers; she also spoke well of the supervisor who talked to Childers over the phone that day. As for the changes that have occurred since that call, both the AECC and the city manager have made adjustments. The call center has added those police and fire professionals to work alongside the personnel taking the calls at the AECC ... and the city manager has apologized to the dispatcher, and to the public, for the manner in which he conducted himself. 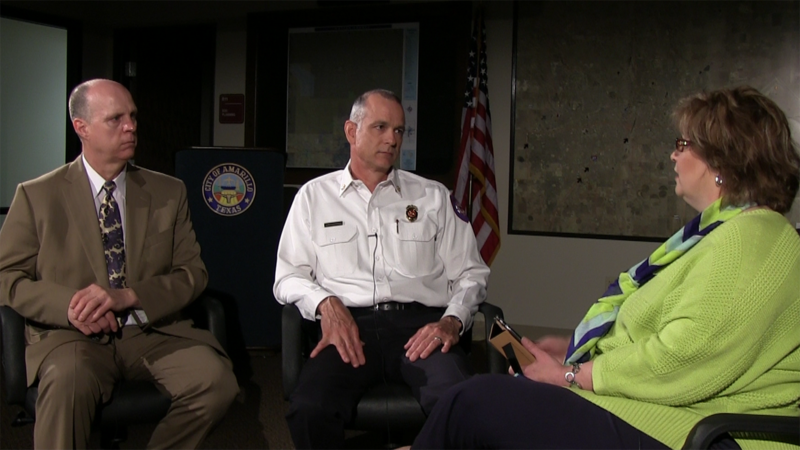 Live Here will air Thursday at 7 p.m. on Panhandle PBS and will examine the changes that have occurred within Amarillo's emergency response system.